This guy is nobody but the person who kidnapped the son of a famous programmer and businessman Evgeniy Kaspersky and who’s serving his sentence now. 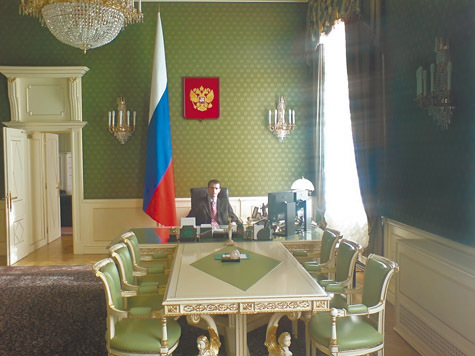 On the photo above he is sitting in the Kremlin office of the Russian president. He did not mind sharing such pictures not only with girls he wanted to impress but in various social networks as well. The guy considers himself to be the second head of the state. But how did he manage to take such shots? 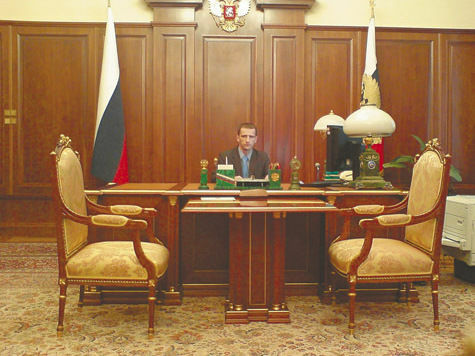 Putin allowed him to sit on his chair??!! this is the REAL Russian president. the other monkeys youve seen since Yeltsin have been what i just wrote….MONKEYS. ok yes its true medvedev was president of south ossetia for 2 and half months and putin prez. of kyrgystan for less than a month. but prez. of RUSSIA – NO WAY – YOU HAVE GOT TO BE THIS GUY. This is a very good manifestation of how corrupt this country is. Even a patty thieve can arrange to sit at the first desk for a few min.